Yeah, but: You've gotta know this is going to be about photography. The Long Version: Hats and I have a difficult relationship. I frequently like the concept, but rarely wear them; I own five already, but I'm always looking for something better. I want them for rain and sun, neither of which are common in Toronto, and they're likely to be left at home when I need them. I bought a new one for my trip to Chicago, but it got swiped in Detroit. I miss it, and have been looking for a replacement for a week now. Shopping for a hats and I have a difficult relationship. I don't care for - about - any of the mainstream professional sports, and think it's a little weird to wear these totemic emblems of monopolistic businesses whose marketing strategy is to falsely align themselves to home-town loyalties. (Put another way: seriously, dude, you're five foot six - nobody thinks you're a basketball star.) I'm actually not a huge fan of logos in general, and it continues to amaze me when people confuse the concept of multi-billion dollar companies with "friend". While I'm both a photographer and Apple computer user, two famously brand-loyal demographics, I care about Apple or Nikon about as much as they care about me. I'm also not interested in the current fad of hats with brims that could double as a shovel or serving platter, or those fancy foil stickers that prove that the hat has never been washed. So right off the bat, almost everything is disqualified. Ultimately, what I wanted was something simple. I already have organic cotton caps in colours that match my Domke F6 (sand) and F1X (olive) camera bags, so I was looking for something a little more upscale in black to go with my Billingham bag. And since I'm most likely to be wearing hats while using a camera, it can't make me look like a complete tool when I have it reversed. 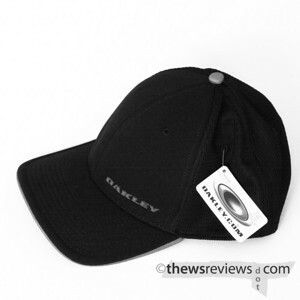 The result is this golf-style cap with two of Oakley's logos on it. They're subtle, and I'm okay with Oakley, since they were once a pretty serious optics company. (One of its founders has used his play-money to build the camera company Red, which is one of the more interesting developments of the past decade.) I was initially worried about being too matchy-matchy, since I use Oakley frames with both my eyeglasses and sunglasses, but have since gotten over it. The hat's constructed from six panels, with the sides and rear being a mesh fabric for ventilation, but not so loose a weave that it looks like a cheap ballcap. I have worn a meshback once, but it was a fluorescent orange one from Walmart that I wore in the northern woods during deer season. I figure that makes it okay. 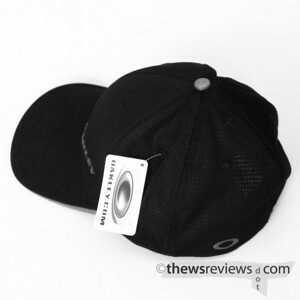 While the hat is predominantly light black, the trim is grey, including the underside of the brim. That gave me an idea. I pulled out all of my grey references, and compared the results of the Lightroom eyedropper tool. I would take a white balance reading from each target, and knew that I'd gotten it right when the colour didn't change when I switched it to greyscale. The Xrite Passport and old-skool Macbeth target gave me essentially identical results, at 6650+9 and 6550+9, respectively. 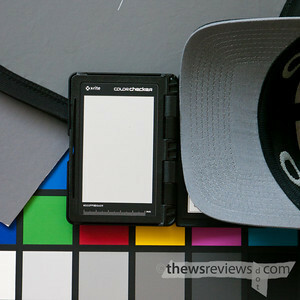 The Ezybalance came in at 6900k and +15 magenta, while the exposure-target-only Delta grey card was 7200+13. The camera thought the correct white balance was 6900+7; Lightroom's auto setting wanted 7500+10. The hat came in at 7750+3. So it's not exactly perfect, being too blue, but it's certainly better than nothing. Not much better, but maybe a little bit, and I'll take it if it's all I've got. So it's a hat. I like it, and it will be something I use occasionally. Maybe I'll have it for years, and maybe it too will be gone in a couple of weeks. It's not the best I've seen, but it's pretty good. What else can I say? I needed a hat. Hats are my personal white whale. As big-headed as I sound when I blog/review, the truth is that my hat size is well over 8, but I won't be more specific than that. I have one big brimmed XXL hat that I got at Bass Pro Shops, and it's still a little tight. Most of what we call "Gimme" caps here in Texas (give-aways) are too small, with the exception of some red Marlboros I scored 15 years ago. Visors with velcro bands serve me well enough, but 77.4% of them don't fit, either. I want an Aussie Commando hat like my dad and his crew wore when flying gunships for the 4th AQS in VietNam, but I would have to undergo the shame of ordering from www.seriouslyhugemelons.com. Sizing was something I forgot to mention - all of the fitted hats were marked S/M or L/XL. What's wrong with just calling them "S" and "L"? They're only made in two sizes, so we don't really need to say that they're overlapping four categories, do we? Especially since S/M is probably a size 6, and L/XL is a size 7. I can't even imaging something over 8. On the bright side, I'm pretty sure seriouslyhugemelons.com uses discreet packaging, and their name will not appear on your credit card.